Pumpkin is loaded with fiber, is low in calories, and has lots of beta carotene and vitamin A.
It’s also naturally sweet, which dogs love.You can keep this kibble for 2 weeks in the refrigerator or 3 months in the freezer in an airtight container. *Sweet, easily digestible pumpkin is a great source of insoluble fiber. 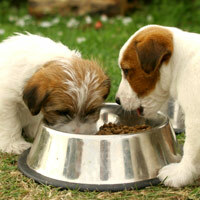 Adding a tablespoon or two to your pet’s food can help minimize gas and diarrhea. 1. Preheat the oven to 300 degrees. Spray two large cookie sheets with nonstick cooking spray. 2. In a large mixing bowl, combine the flours, milk powder, rolled oats, bone meal, wheat germ, salt, and parsley. 3. In a smaller mixing bowl, beat the eggs. Blend in the oil, molasses, and Worcestershire sauce. 4. Add the water to the flour mixture and mix well. 5. Fold in the egg mixture and combine it all evenly. 7. Spread the dough on the cookie sheets, making it very flat and thin. Use a knife to cut the dough into small squares. 8. Bake for 45 minutes to 1 hour or until the kibble is golden brown and not doughy when you break a piece open. During the baking process, take a wooden spoon or spatula and move the kibble around on the cookie sheet so that it bakes evenly. Then turn off your oven, keeping the door closed, and let it dry out in the off oven for at least 4 to 6 hours or overnight. 9. When you remove your kibble from the oven, it will still be slightly warm and moist. Let it sit on cooling racks for another hour or two until it is completely dry and cool. Once dry, break the kibble into pieces.